Personalized Arch Shape Address Sign with Retriever - - the best personalized plaque for any dog lover. Holds one or two lines of personalization. Available for standard wall mount or with optional lawn stakes. Made in USA. Arch shape plaque dimensions: 15.75"W x 9.25"H. Image of a playful retriever fits into the arch. Rust-free recycled aluminum address plaque. Line 1 holds up to five (5) 3" characters or up to seventeen (17) 1.25" characters. Optional Line 2 holds up to seventeen (17) 1.25" characters when you select a two-line sign. Note: Character count includes spaces and size may vary depending on the number of characters. 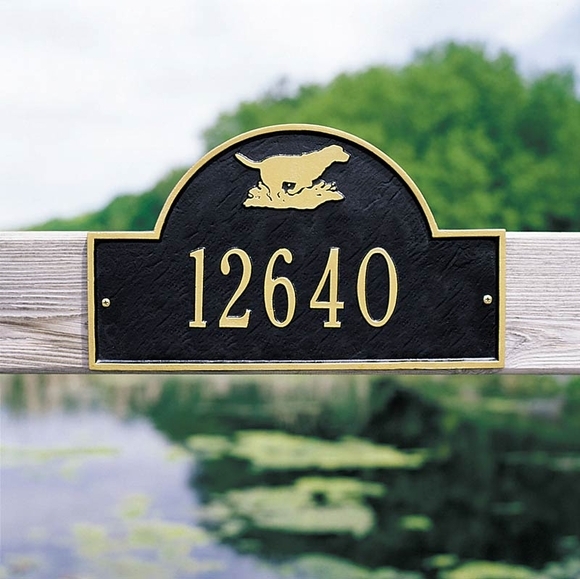 Retriever Arch address plaque holds one line or two lines of personalization. Sign looks great! Arrived on time and was package well. Easy to install as long as you have a level and a screwdriver.